Monday morning, I had time for one last Roadfood stop. 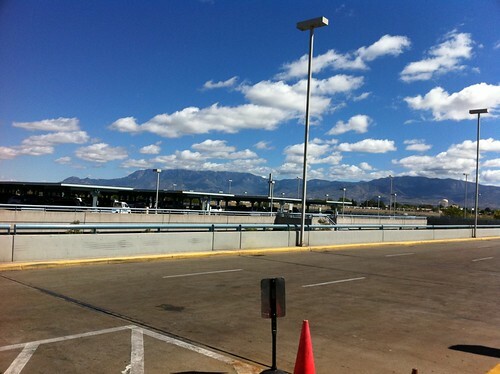 In retrospect, I could probably have made it to Santa Fe for breakfast, but I stayed in Albuquerque. This sign along the drive made me do a U-turn and stop to take pictures. The sign says "The bus is never closed to crazy", which is very poetic if not very clear. 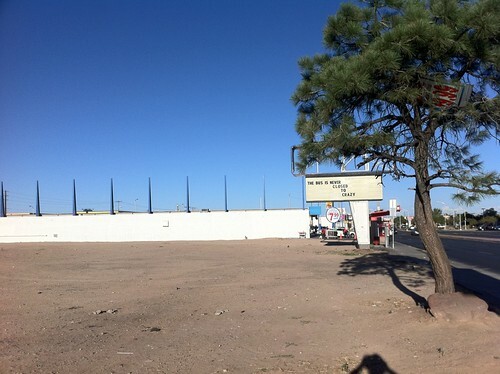 My guess is that this is the site of a former establishment that is trying to invite fanciful redevelopment. I did not notice the sign in the tree when I took the picture; I'm curious about it, but don't know what to make of it. Across the intersection was the fabulously decorated KiMo theater. 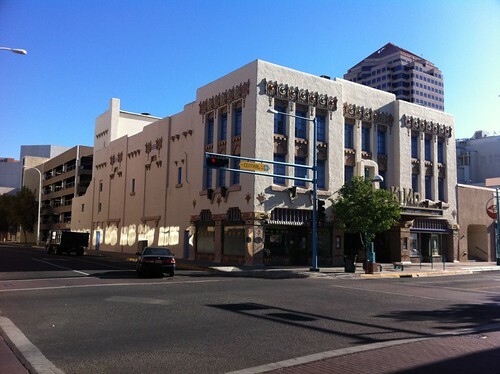 http://www.cabq.gov/kimo/about-the-theater calls it "the undisputed king" of Pueblo Deco theaters. 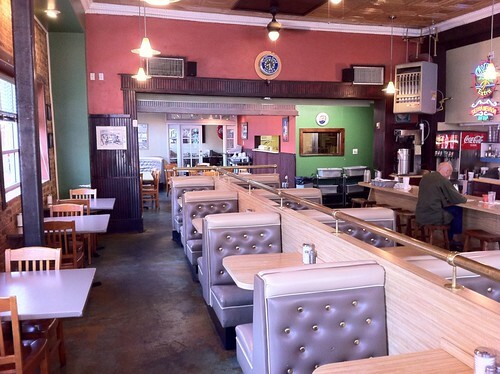 I ordered a breakfast burrito as one last New Mexican food that I hadn't yet sampled on this trip. I wasn't wild about this burrito; it tasted only of eggs and chile sauce, not of the bacon or cheese or other ingredients. 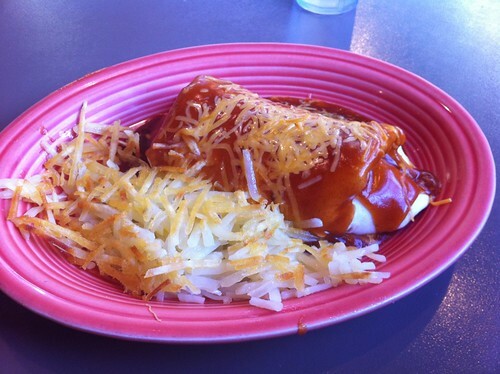 Also, I am used to thinking of breakfast burritos as something to eat with one's hands - but the red chile sauce put that out of my mind. The hash browns were really nicely crispy on the first bite, but on the second and subsequent bites, they were really unpleasantly greasy. This was probably my least favorite of all the meals I had on this trip. 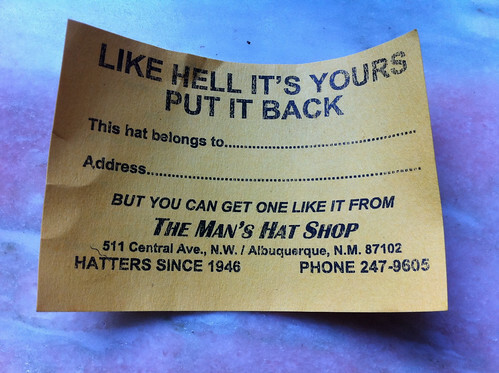 But I'm glad of visiting Lindy's anyway, because if I had not visited Lindy's, I would not have had a delightful experience at the Man's Hat Shop in Albuquerque. 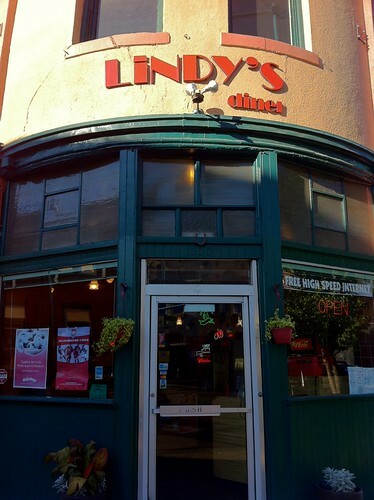 I thought I would miss it, because their door said they opened at 9:30 and I left Lindy's at 9 - but they opened for me as I passed by. Perhaps it was because I was already wearing a hat and therefore recognized as a member of the fraternity of hat-wearers. • I learned what hat-wearers do when riding on airplanes with a stiff hat: they carry the hat on their laps. 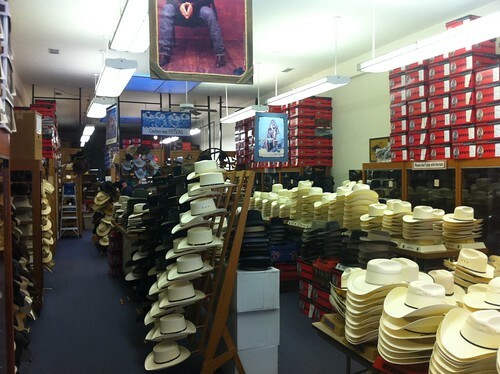 • I learned that the wool felt hat I've been wearing cannot be easily cleaned - at least not with the steam machines the shop uses for fur or straw hats. That's the price I pay for wearing a crushable hat. • I learned how to get a chin strap out of the way and still look reasonably stylish. 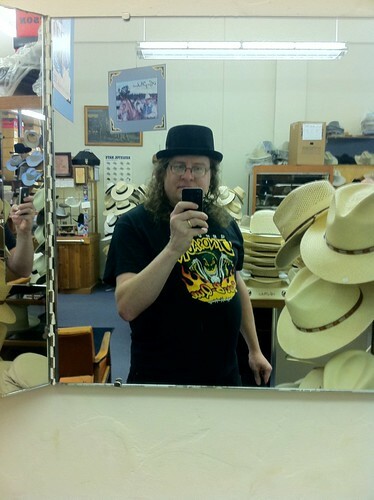 • I saw a fedora that was the spit and image of Indiana Jones' hat, and I learned that that fedora is quite stiff. This surprised me - if anyone would need a crushable hat, I'd think Indy would. I tried on a porkpie hat. I considered buying it, but I depend on my hats to shade my eyes instead of sunglasses, so I wasn't sure I'd do well with the smaller brim. I was very tempted by the fine hats they had for sale - but I feel I need my hats to handle crushing well. I often end up having to tuck hats under my chair in restaurants, and I'm uncoordinated enough that I end up stepping on them from time to time. So instead, I bought a very nice drover hat by Barmah; it's crushable and it lets the breeze through, so it's much cooler in the summer than my wool felt hat.